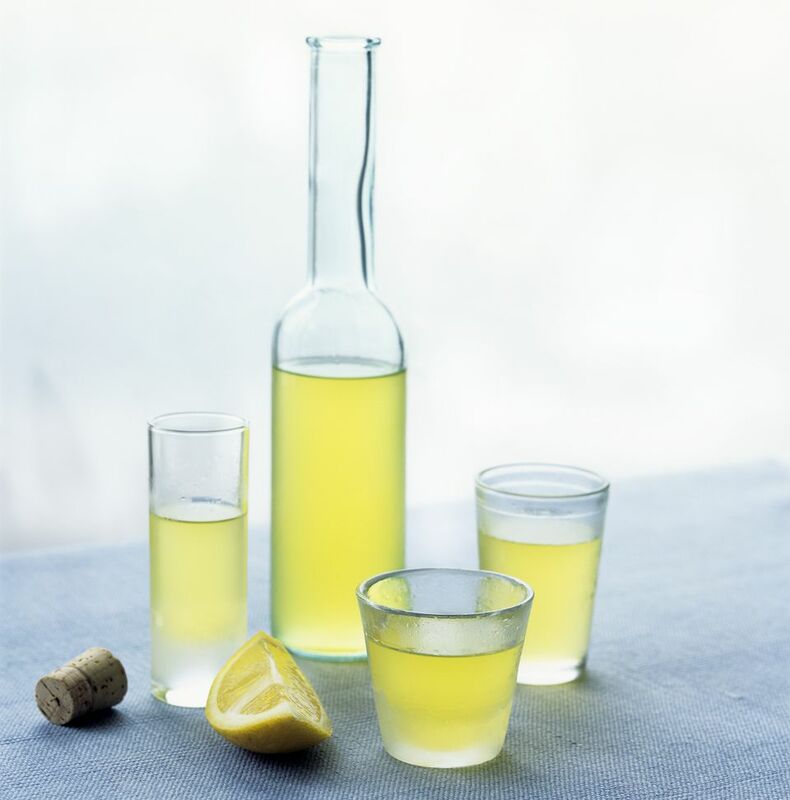 Limoncello is a delicious lemon liqueur native to Southern Italy. Limoncello can be quite pricey but you can make your own limoncello at home with this simple recipe. Put it in a nice bottle, add a handmade tag and it makes a beautiful gift. Use organic lemons if possible because only the peel is used and you want to avoid any unnecessary coating or pesticides. Making the liqueur takes little time in your kitchen, but you need to plan ahead as the steeping time will be 40 to 80 days. Be sure you have a secure cool, dark place to store 1-gallon glass jar used for steeping. ﻿You won't need any fancy equipment to make limoncello, but you will need a narrow-neck funnel, fine-mesh strainer, and four 1-liter bottles for bottling. Wash a 1-gallon glass jar and lid in hot, soapy water and dry thoroughly. Alternatively, run the jar and lid through the regular cycle of your dishwasher. Scrub the lemons in warm water and pat dry. Using a vegetable peeler, remove the peel from each lemon in wide strips. Be careful not to remove the white pith, which will impart a bitter flavor to the limoncello. Place the lemon peels in the prepared jar and pour in 1 bottle of the alcohol. Push down the lemon peels with a wooden spoon to completely submerge them in the liquid. Tightly secure the lid and set the jar in a cool, dark place to steep. Stirring is not necessary. After 20 or 40 days, add the second bottle of alcohol to the mixture. Place the sugar and 7 1/2 cups of the water in a large saucepan and bring to a boil over high heat, stirring to dissolve the sugar. Decrease to a simmer and cook for 10 minutes to ensure that all the sugar is completely dissolved. Remove from the heat and cool. When the sugar syrup is completely cool, add it to the lemon and alcohol mixture in the jar. Tightly secure the lid, and return the jar to a cool, dark place to steep for an additional 20 to 40 days. Over time, the liquid will absorb the flavor from the lemon peels and turn bright yellow in color. To bottle, first wash the bottles in hot, soapy water and dry thoroughly. Alternatively, run the bottles through the regular cycle of your dishwasher. Strain the liquid through a fine-mesh strainer, or coffee filter set in a strainer, into a large bowl. Add 1 2/3 cups of water to the limoncello if you used 151-proof grain alcohol; add 2 cups of water if you used 190-proof. (Note: The addition of the water will turn the liquid cloudy and pale yellow in color. This is the desired outcome.) Let it rest for a moment so that any remaining sediment will fall to the bottom of the bowl. Using a narrow neck funnel, ladle the limoncello into the prepared bottles, leaving 1-inch headspace. Wipe the rims clean, secure the lids, and label. Serve after dinner as a sipping beverage and enjoy. Store the bottles in a cool, dark place, or keep in the freezer until ready to serve. Limoncello will keep for several years. Tie each bottle with raffia or ribbon and attach a gift card. To turn this into a gift basket, add a set of cordial glasses. Add a fun tag that says: "This homemade Limoncello was bottled on [give date] and can be enjoyed for several years to come. Store it in the freezer, and enjoy it as a refreshing liqueur to sip after dinner."